The paintings of the Screen series continue Pip Dickens’ sensitive exploration of the aesthetics of Japanese culture through furniture screens, as well as considering filmic interpretations of the screen motif. Together, they constitute the centrepiece of her exhibition currently showing at Rugby Art Gallery and Museum. Overall, the work reveals a plethora of opposites: the contrast between sharply focused and blurred, explicitly defined and ambiguously undefined, receding and projecting forwards. In fact, these diametric shifts are central to Dickens’ explorations of visual perception and the ocular sensations of push and pull that her paintings sometimes induce. In this sense, viewing some of them is not dissimilar to watching a 3D movie when the camera zooms in or pulls out. 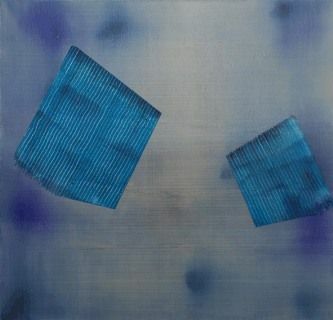 A teasing example of this effect is Artificial Intelligence, 2013, in which the vertical and horizontal grid of lines in the background confer a tactile evocation of the weft and weave of textiles. Its continuity is broken by the scraped forms of heavier pigment that then come to the fore. These more defined blocks float effortlessly atop the visually distant ground. Whilst much is made of the thematic catalyst, such is the evident enjoyment of moving paint around, one wonders whether the originating inspiration is simply a means to an end. A conduit to the act of painting, in which the artist’s concern is to ascertain what may emerge through the application of opaque, milky and transparent layers and the subsequent piercing of their strata. Her paintings seemingly testify to a game of cat and mouse whereby the magician’s slight of hand often wins out. As if to give weight to this possibility, Dickens is not afraid to experiment with the conventions of painting by pre-dying the canvas prior to stretching. In this way, pigment looms underneath surface matters; sometimes a luminous undercurrent and on other occasions, a ghostly shadow. An example of the former resides in Composition #4. The under painting, or to be more accurate, the stains beneath are overlaid by an accrual of layers, with the final application a smearing of viscous Vaseline-like unguent. 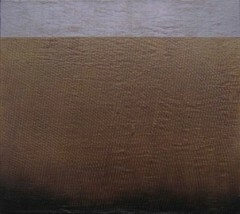 In this painting, depth is more literal, whereas in paintings like Split Screen, 2013, the repeated scraping of the surface has ploughed troughs and peaks that become spatial through the optical illusion of moiré patterns. In order to restrain, or remind of, the presence of illusion, Dickens often creates areas of flat monotone. A striking and explicit example of this demarcates Dusk: Vibrations of Air, 2012. 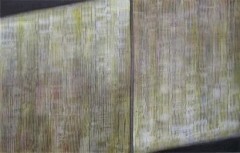 A painting in which a horizontal band of densely opaque silver cuts across the top fifth; indicative of gaffer tape or the pitted surface of aluminium roofing tape. Its orderly weight, a necessary counterbalance to the shimmering delights below. The metallic strap caps the dreamy and magical pool of motion below. The repeated circular combing of its beige surface means it never stays still. 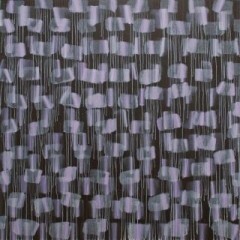 A contemplative, meditative ripple meanders round the canvas, like a swirling eddy. This painting could even be considered digital, as the precise technical means of production remain unclear and it therefore has a printed quality. It is a timely apparition given the filmic shift from celluloid to digital; and one could easily imagine these paintings becoming animated through digital technologies. Dusk: Vibrations of Air is no doubt a highlight of the show, along with the cosmic delight When the Stars Fall, 2013. A spatial voyage, which, just as gazing at the night sky, reveals ever more of its nuances with continued viewing. 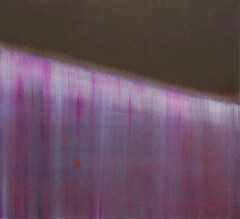 A dark diagonal swathe marks the upper third of the canvas, almost hiding the vibrant stellar pink splatters that dance throughout. The blackened void gives way to a luminous reveal that has been brushed out through streaks of white and vibrant printer’s magenta. Some of the most recent paintings are the loosest, as if the shackles have come off and caution been thrown to the wind. The dynamic results can be witnessed in works such as The Last Cells – Final Cut, 2013, which bring to mind the later paintings of the American abstract expressionist Joan Mitchell. Seemingly composed by two undulating layers of dripping daubs of mauve, and notwithstanding its disconcerting simplicity, greater spatial depths of illusion have stretched. An exciting development, made all the more so by the animated traces of what one imagines to be a speedy production. This velocity proffers a different flavour to the more measured timbre of the other paintings on display and helps give this thoughtful and worthwhile exhibition greater breadth. A quality further extended by the welcome inclusion of one of the artist’s sketchbooks.